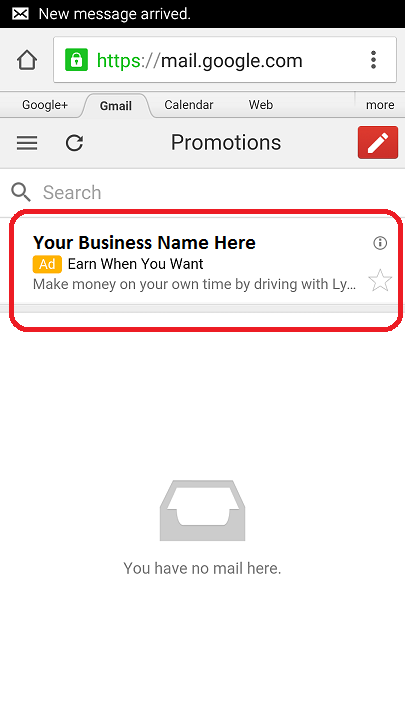 In using Gmail these days, you have undoubtedly seen and probably accidentally clicked on a Sponsored Ad interwoven within your inbox. Google has been pilot testing these ads and refining them to be run through Google AdWords. The Google official release suggests that these sponsored ads are now more integrated and therefore engaging. While we are highly critical of the overselling of that point, we do, however, give credence to the fact that one change is less ads in the same space. Google’s attempt to “show fewer, higher-quality native ads that integrate more seamlessly with the inbox experience” is progress, since we know that the majority of users will rarely intentionally engage sponsored ads, regardless of “relevance”. The exception being Remarketing, potentially. Advertisers are only charged their AdWords cost per click charge if the ad is clicked upon, which expands the ad to the full-page view. This is true for both mobile and desktop/tablet version of these Gmail sponsored ads. Contact us with questions, for help or to talk to our Certified Google Partner team about this or any other topic. Tags: addiction rehab marketing agency, adwords agency, adwords company, adwords expert, adwords gmail ads, adwords manager, adwords professional, gmail ads, gmail ads through adwords, local adwords agency, local adwords company, local adwords expert, rehab marketing expert, and rehab marketing ppc company.